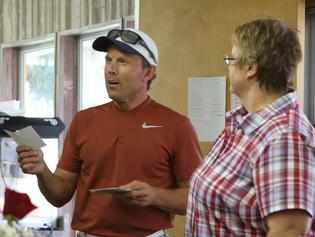 Rusty Papachek, Chair of the Advisory Board and Tournament Director, and Jill Eggl, Advisory Board Member, announce tournament winners! 11th Annual gathering of golfers and carts! Once again, an exciting silent auction item was donated by Mark and Carla Eggl, Greenville, SC. The Fripp Island, SC Getaway included a 7-night stay at Ocean Side Villa, with lodging for up to 4 people, and 8 rounds of golf at either the Ocean Creek or Ocean Point Golf Courses on Fripp Island, SC. Thank you, Mark and Carla - and thanks to Dr. Lana and Jay Nicholas for your winning bid! 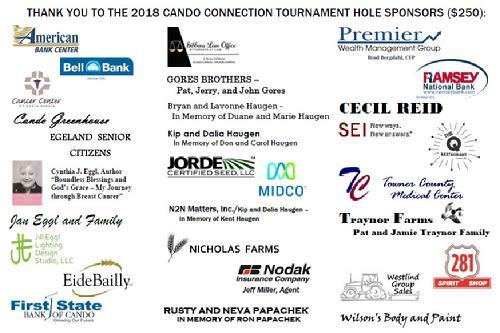 Our sincere thank you to the following individuals, families, businesses, and organizations for their support of the Impact-Cando Connection Fund through participating as a hole sponsor, team sponsor or door prize sponsor for our 11th Annual Cando Connection Golf Tournament 2018. My Journey through Breast Cancer"
Some great door prizes were gathered by Vicki Lingen, Jan Westlind, Amber Vangen and Jeff Sivertson - Thank you! The generosity of door prize donors was very much appreciated - our sincere thanks!